YoYoFactory - Gentry Stein Signature Model Geared for Responsive Play! The Gentry Stein Signature Replay PRO is one of the top performing molded plastic yo-yos you can get your hands on. It was received so well and plays so good that the guys at YoYoFactory decided to make a responsive model to make the Replay available to everyone from beginner to pro - This is the Replay! 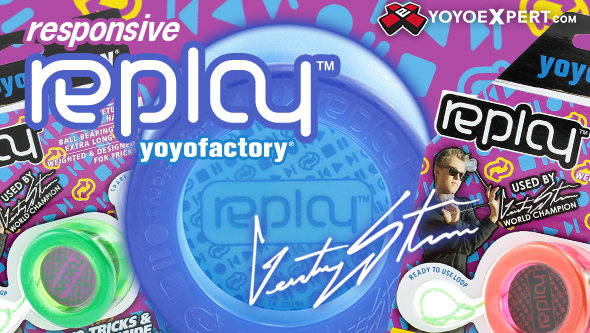 The Replay is the first of its kind a signature YoYoFactory model that anyone can use! The Replay combines the body of the competition winning Replay PRO with the inner workings of YoYoFactory's best beginner models to make a beautifully designed yo-yo that anyone can pick up as their first yo-yo. With the Replay, YoYoFactory is trying to reach a broader audience with a modern yo-yo designed for beginners while also introducing more people to Gentry Stein, the modern yo-yo player. Best of all, the Replay is easily transformed into a Replay PRO by using the parts from the Modern Performance Upgrade Kit (swap out the bearing and pads for 100% unresponsive performance). Learn to play with the all new YoyoFactory REPLAY!